Here at Screeduct, we offer a wide range of pipe trunking solutions. In any environment, pipes require significant protection. When pipes become damaged, this can cause a contents leak. If they are water pipes, this can cause flooding and damage to the building and flooring. In the case of a gas leak, there can be much serious problems such as health issues and fire risks. In any of these circumstances, significant time and cost must be invested to correct these issues. 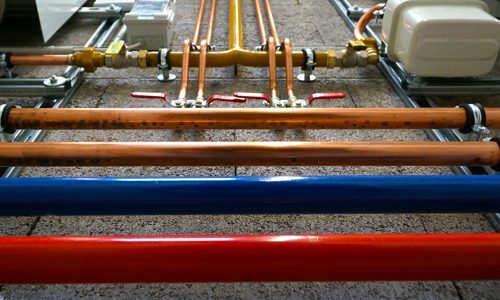 In addition, without trunking, the pipes may be difficult to access, meaning further resources are required to fix the issue. Our flush floor pipe trunking can be installed with access covers. These modular covers fit within the floor, giving minimal interruption to the surface, and can be easily removed in the case of any maintenance, repair or plumbing work. We can offer a bespoke trunking product, giving you control over where you would like the access covers, for the best solution for you. Specified across a variety of project in a range of environments, you can have confidence in our pipe trunking. Whether it is required as parts of a new build or renovation project, we work closely with the building contractor to ensure efficient fitting. Pipe trunking can be manufactured from a range of materials including galvanised steel and aluminium. For more information on the materials we use, please visit our heavy duty trunking page. For more information on our range of pipe trunking, please get in touch. We would be more than happy to talk through your requirements and provide you with the best recommendation. Be sure to also check out or projects page for an insight into some of the projects we have completed across the education, healthcare, transport and many other sectors. Our trunking can also be used for electrical cable trunking and service ducting.